iFishAlaska Guide Service works with several different local cabin rentals, lodging and fishing lodge businesses that provide various places to stay in Alaska. They all offer various levels of fishing and lodging packages for their guests. 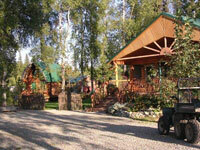 Several of these businesses participate with us to offer you affordable Alaska lodging and vacation cabin rentals. Our Alaska Fishing Lodge is a Bed and breakfast perfectly suited for the traveling fisherman who wants to experience both the exhilaration of hooking and catching wild Alaska salmon and the comforts of a modern and spacious newly constructed 1800 sq ft 4 bedroom 3 bath lodge. Rooms are comfortable, clean, and are available with private on suite bathrooms. 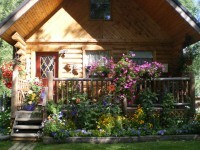 If you’re looking for lodging in Alaska or to save money over staying in Alaska hotels, then stay with us in our B&B. You’ll have the use of a full kitchen and dining area to cook meals or an outdoor BBQ area to cook your freshly caught salmon. 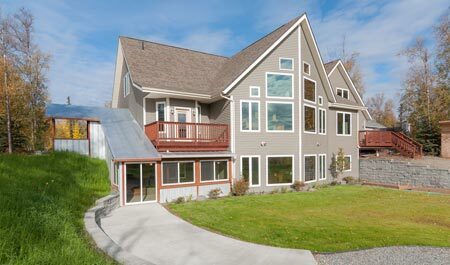 Wer’e located in Wasilla, only 3 miles from shopping, restaurants, and many popular attractions. Lodge can accommodate groups of up to 10 people. This Alaska fishing lodge is a wonderful option for places to stay in Alaska. It’s located at the Deshka Landing where we meet our guests for our daily Deshka River charters. They have cabin rentals with B&B service or they offer full service packages with meals, fish processing equipment and fish freezing included. No matter what kind of Alaska fishing vacation package you are planning, this affordable Alaska fishing lodge is one of the Best Lodges in Alaska. These are charming log cabin chalets that are on five wooded acres in a private setting, yet are only minutes away from Wasilla activities, attractions and shopping! Each of these fully-equipped cabins can comfortably accommodate up to 6 guests. They are perfect for adventure travelers, families or anyone who wants to experience the Alaska wilderness in style! 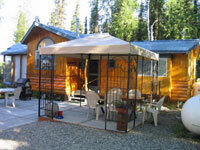 Vacation cabin rentals located at mile 87.9 Parks Highway, mid-way between Anchorage and Denali National Park. Located north of Wasilla near Sheep Creek. If your looking for places to stay in Alaska, consider them. 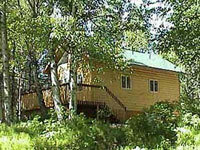 Several nice cabins to choose from that are centrally located. Views of salmon stream and mountains. Each cabin suite is equipped w/ all bed linens, blankets, towels, cookware & utensils. Complimentary coffee & light condiments (salt & pepper, sugar). Other amenities include Queen beds, private deck, full kitchen, jetted tub, gas fireplace, phone, TV, Stereo. For fisherman, extra freezer space is available upon request. This is one of the newest faculties in Wasilla and is a great place to stay. This hotel has 79 guest suites spanning three floors. Business-friendly amenities include work desks, phones with voice mail, and complimentary high-speed Internet access. 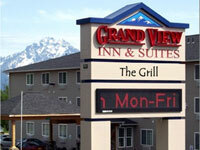 They have a restaurant, pool and sauna and are centrally located on the Parks Hwy in Wasilla. Mountain views are available from some rooms.